My wife, Beth, and I have made many different wine trips around NorCal and we’ve built up a string of places that we really enjoy. As various friends and co-workers learned this over the past few years, I’ve started writing some rather extensive emails of recommendations for places we like in different regions. So far, I’ve made a Napa Valley, Carmel-by-the-Sea/Carmel Valley (my favorite AVA), Sonoma Valley, Russian River/Alexander/Dry Creek Valleys and a small one for Amador County (where I actually haven’t spent much time). I thought that these would be great to post here and keep kinda updated. In honor of the home team, I’m going to post about Napa first. I have included links to each individual website, as well as the accompanying information we have on WineLog [WL]. Enjoy! Definitely on the larger side of things, but truly an amazing winery and a spot to taste. In one half of the historic Christian Brothers Monastary, it houses a wonderful collection of wines and an incredible, free art gallery of modern art collected by owner Donald Hess and his family. I grew up in Brown’s Valley, down the road, and what you’ll drive through to get to Mt. Veeder Rd, along the way to the winery. We’ve been members here for some time. I love all of their wines, particularly their Cab’s, especially the flagship “The Lion,” and their various Bordeaux and Rhone-style blends and meritages (try the Mountain Cuvee!). Known for their high-end VGS label of wines, these Very Good Sh*t wines are pretty good. But what we like the best is the drive up there (you can just continue on Mt. Veeder after Hess if you like) and the stunning view from up top. As far as I know, they are the highest winery in the Valley and it shows. You wanted a tiny, family-operated winery and here it is! They are the oldest continuously operated winery in Napa, in fact, surviving the two Phyloxera epidemics in the 1890’s and 1960’s and Prohibition, in-between. My family has been members for many years and I grew up going here for picnics. Beth and I became members last year. They are old-school Italian, to boot! They have a large variety of great wines including very well-priced back-vintage Cab’s and a wonderful and rare white, Sauvignon Vert. It’s kind of a much more greener (in a good, refreshing way) Sauvignon Blanc, but more, I guess, Limey-flavored with lots of crisp acidity. The Patriarch of the family just passed away, however, so make sure they’re open for tasting before calling. Then picnic under the olive trees just a walk down the hill and play some bocce ball after you’re done eating, and finish that bottle of Vert you bought for the picnic! This is right near my high school and is also where my good friend Jeffro, had his first wine internship. It’s been family owned for as long as it’s been around. This is also where Jeffro, myself and some family and friends made some wine in 2005, that we’re just starting to drink right now. They try and bridge the gap between new world, big fruity, earthy, ML and oaky wines and more understated, structured feminine French-style wines. I really like their Cab’s (of course) but I *love* their Cabernet Franc and their dry Reisling. Though it’s a bit pricey, it’s worth it to try the reserve tasting in back especially if you can handle doing both the Estate in front and the Reserve in back for that style comparison. OK. This winery just opened a little over 6 months ago and it’s built for tour buses from Phoenix. On the other hand…it did *just* open, so go there now and see what’s it’s like at a winery that’s about to explode. They truly have one of the best Rose’s (Merlot) and Cab values in the Valley right now. Their 2002 Napa Valley Cabernet Sauvignon is a beautiful example of an understated, yet fruity Napa Cab, and it’s only 30ish bucks! This is one of the original families in Napa. They say they’ve been operating for 80-some odd years, but really, the winery was restarted in the mid 90’s after, I don’t know, 80-100 years of disuse. They have been growing grapes in the Valley, however, for many decades. This is right up there with Hess for my favorite wineries in Napa. They’re pricey, but damn it’s worth it. Their Cab’s are superb, some of the best in California, and their Zinfandel is still the best that I’ve ever tasted, year over year….but it’s usually sold out! They are one of the best-known “Ghost Wineries” in California. Check the website for details. This place definitely looks completely ostentatious, even more than Black Stallion. But once you read their history, it turns out to be really cool. It’s one of the few million places in Napa that calls itself an “experience” that truly is one. 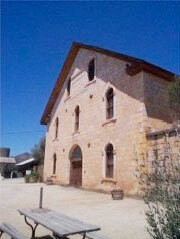 They make fantastic Cabernet’s and Cab Franc’s and their winery is gorgrous. Everything is imported from Lebanon and is based on Persian architecture. 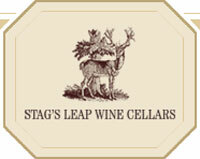 I like Stag’s better than the nearby Stags’ Leap Winery (careful where you put that apostrophe!) except for Stags’ Petite Syrah, they make some of the best wines in the Valley. They’ve been doing it ever since the famous 1976 Paris tasting that they won, along with Chateau Montelena. Their Cab’s are unreal and the property hasn’t changed much since winemaker/owner Warren Winiarski lived his dream and almost bankrupted his young family to start his own winery in the early ’70’s. Interestingly, and perhaps with sadness, the winery was sold this year in a shocker deal due to a what seems to be a lack of familial successorship. Everyone needs some bubbly! 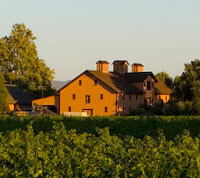 This is my favorite place to go for a Napa sparkling wine house (don’t call it Champagne!!!). There are no small sparklers in Napa, but this one is the most mellow and beautiful, I think, even if it isn’t the original in Napa (Chandon). Check out the Ansel Adams exhibit while you’re there. I wouldn’t really eat a full meal here, more just cool off after a day’s tasting…drink more great wine (it’s mainly a wine bar and store) and have some great hors d’oeuvres. The best coffee in the Valley and where I used to work in high school and early college with my sis. Actually, they are my favorite coffee roasters, followed by Caffe Cardinale in Carmel, Pacific Coffee Roasting Company in the Creek and Illy Espresso. They have two shops, one in the same building as Bounty Hunter and the other (and my fav) in St. Helena, just off Main. An outstanding Italian restaurant with a nice wine bar, to boot. Across the street from the RoCo and Bounty Hunter. It’s got some authentic flair, too. The prices aren’t bad at all (for Napa) and my family has been going here for as long as it’s been open. A gorgeous little country French restaurant in Yountville that is owned by Phillipe Jeanty, the original chef for Domaine Chandon Restaurant. Their wine list is amazing, particularly by the glass, even for Napa. They have a neat little outdoor area and a nice, small wine bar (of course). When I planned my group’s outing while still working at Chiron, we ate lunch here and loved it. You might think that Oakville Grocery is the best place to get sandwiches in the Valley, but you’d be mistaken (and so is everyone else who says so (though they are good!). Instead, try Genova in Napa. Or if you’re Upvalley already, try Sunshine market in St. Helena, right near the other RoCo. This place is incredibly cool. Stuffed inside some old barn or something, it’s a full-on Italian market and, well, olive oil maker. The guy has owned this for longer than I’ve been alive and he still doesn’t even use a cash register…he just writes out the prices on butcher paper and adds them up! Only takes cash, and it’s truly got some of the remaining original charm of Napa. Really, really good gourmet oil and cooking foodstuffs store. You can taste everything in the store and it has (duhduhduhDUHHH) a wine bar, too! Sometimes can be pricey though, so watch for that. Great Wine 2.0 "New Release Only" Event!